Usually the rule in the animal kingdom is that a lot of progeny means a short life – if you are less fertile, you live longer. However, it seems that social insects can escape this fate. 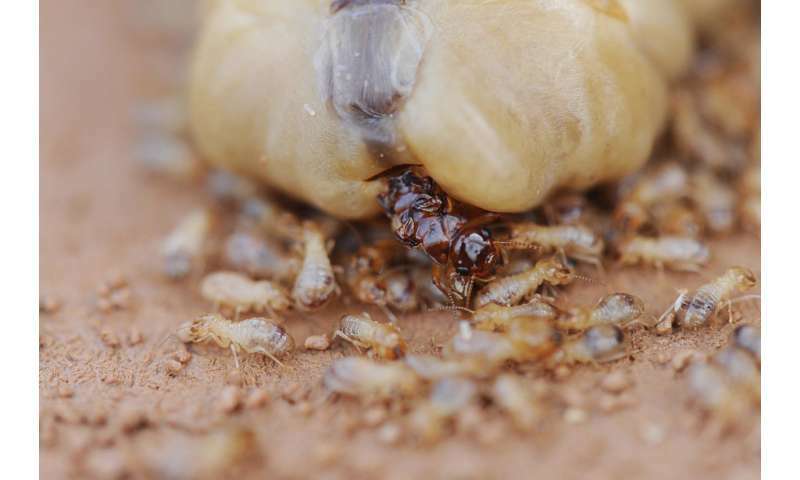 How they do this has been revealed by a research team from the Institute of Zoology at the University of Freiburg, taking the termite species Macrotermes bellicosus as its model. "Macrotermes queens are the most reproductively successful terrestrial animals," says Freiburg biologist Prof. Dr. Judith Korb. Termite queens lay continuously about 20,000 eggs daily. And yet they reach ages of up to 20 years. Workers from this species have the same genome as the queen, but are infertile and only live for a few months. Judith Korb, together with her Ph.D. student Daniel Elsner and Dr. Karen Meusemann, has found a clue to why the queen and king – unlike the workers – practically do not age. The team has published its results in the scientific journal Proceedings of the National Academy of Sciences (PNAS). Korb has studied Macrotermes bellicosus since her doctoral thesis. This termite species lives in the savanna of western Africa and builds meters-high mounds. They have an organized society with division of labor, something that led to the concept of the superorganism [del: becoming established in research]: a queen and a king are responsible for reproduction, soldiers defend the colony, workers build the mound and gather grass and leaves, which are used to feed a fungus that they cultivate in specially developed "gardens," where it decomposes complex plant compounds and thus concentrates nitrogen. This in turn is an important nutrient for the termites, and it limits the growth of the colony if insufficient quantities are available. The extreme sensitivity of the fungus means that the temperature in the interior of the mound must always be around 30degrees Celsius. Now, in order to track down the secret of a long life, the Freiburg team first compared the genetic information that is active in young and old animals and used bythe cells – separately for queens, kings and workers. "We were very surprised by the result," reports Korb. "We found hardly any differences between old and young individuals in queens and kings, but for the workers they were enormous." Daniel Elsner adds, "The handful of differently regulated genes in queens and kings could not be associated with aging, although the insects differed in age by five years. By contrast, in the workers which were just a few months older, thousands of genes were differently expressed compared to the young ones." Unlike in queens and kings, many of these active genes in old workers were so-called transposable elements. These are also known as "jumping genes": they replicate regardless of the remaining genome, establish themselves in different places in the genome, and can thus cause defects, for example, by inactivating other genes. "We already know from other model organisms that jumping genes can be related to aging," says Korb. "But the question is: why are they inactive in queens and kings?" The team's results suggest that the superorganism concept offers an explanation. In a multicelluar organism, the germline is responsible for reproduction. Jumping genes would cause a lot of damage here: they could result in progeny not being viable. So in the cells of the germline there are signalling pathways that incapacitates stop jumping genes. "We discovered that the "piRNA signalling pathway" is down-regulated in the old workers of Macrotermes bellicosus, but not in the queen and king," says Korb. The analogy appears to hold true: in the superorganism, the queen and king take over the role of the germline, which should have as few genetic defects as possible. The workers meanwhile represent other body cells, which are replaceable and therefore "allowed" to age. It would, after all, probably be too energetically costly to maintain an active piRNA signalling pathway permanently in all the cells of an organism – or in all the individuals of a colony. In a next step, the team wants to conduct experiments to find out whether the identified connection is causal. "We will down-regulate the piRNA signalling pathway in queens in the laboratory, and we expect that they will then also age," explains Korb. The researchers also want to study termite species that live in less complex societies – with the aim of examining one of their core hypotheses: "The more social a species and, related to this, the stronger their division of labor is, the better it succeeds in escaping the negative connection of fertility and lifespan."